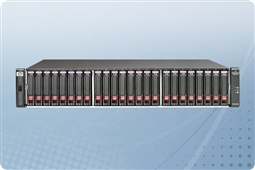 The MSA 2040 SAN delivers flexible, high availability, extremely scalable and performance-driven storage for the most demanding applications, whether it be consolidation or virtualization, remote office deployments, and snapshot or archive repositories. The MSA 2040 SAN model features converged SAN controllers that allow user-defined high-speed interfaces (1GbE iSCSI, 10GbE iSCSI, 8Gb FC, 16Gb FC or mixed mode FC/iSCSI) based on SFP selection. These flexible network options mean you can adjust your connectivity as your needs and applications change. As the high-performance sibling to the MSA 1040, the MSA 2040 offers twice the number of host ports, SSD support and twice the expandability over the MSA 1040. In addition to the MSA 2040 SAN model, HP also offers the MSA 2040 SAS model, which offers simple direct-attached host connectivity without additional switches. All MSA 2040 models include 24-bay 2.5” hard drive or 12-bay 3.5” hard drive chassis options. Take advantage of the performance boosts offered in the MSA 2040’s advanced virtualization, automated tiering, and provisioning capabilities today and customize your storage system below! Wondering if the HP StorageWorks MSA 2040 (Storage Area Network) iSCSI Fibre Channel Combo array is right for your business continuity and budget? Check out our Survival Guide: Avoiding A Data Apocalypse today! 3.6TB (6 x 600GB) 15K 6Gb/s SAS 3.5"
18TB (6 x 3TB) 7.2K 6Gb/s NL SAS 3.5"
6TB (12 x 500GB) 7.2K 6Gb/s NL SAS 2.5"
12TB (12 x 1TB) 7.2K 12Gb/s NL SAS 2.5"
1.75TB (12 x 146GB) 15K 6Gb/s SAS 2.5"
7.2TB (12 x 600GB) 10K 6Gb/s SAS 2.5"